Dubai: It’s not just adults who are excited to see Pope Francis in the UAE in Abu Dhabi from February 3-5. Ahead of the first ever papal visit in the GCC, children too are equally intrigued, hence the release of a new children’s book titled ‘Meet Pope Francis in the UAE’, which answers the long list of questions children might have about the head of the Catholic church. Father Gandolf Wild, secretary to Bishop Paul Hinder, the Apostolic Vicar of Southern Arabia, distributed a few copies of the book to children on Thursday. “They were super excited to know that Pope Francis as a child was just like them and loves soccer even today,” said Father Wild. 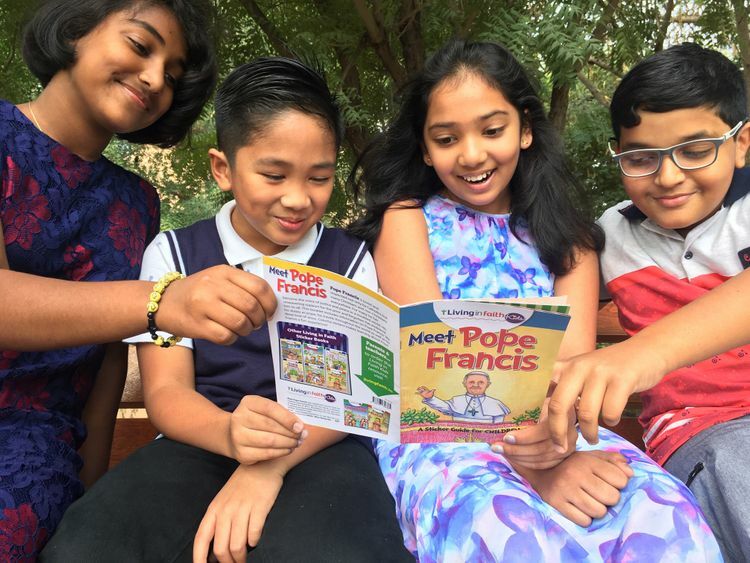 Designed with stickers to encourage children to learn about Francis’ path to becoming Pope, the book will be used in Catechism classes that are attended by more than 25,000 children in the UAE. The hour-long weekend lesson helps to build and shape a child’s spiritual belief and faith. “The book is being used to explain the significance of Pope Francis’ visit to the UAE,” added Father Wild. “Catechists will discuss the role of the Pope, his ministry and why he travels for peace, harmony, respect for others and creation. Parishioners who would like a copy may get one for Dh5. A total of 50,000 were published. Fast facts about Pope Francis. He was born Jorge Mario Bergoglio in Buenos Aires, Argentina on December 17, 1936, to Italian immigrant parents. He earned a chemical technician’s diploma from high school. Aged 21, he fell sick with pneumonia, resulting in the removal of part of his right lung. A year later, he entered the Jesuit novitiate, and took his vow as a Jesuit two years later in March 1960. He taught literature and psychology at Jesuit high schools in the mid-1960s and was ordained to the priesthood on December 13, 1969, aged 32. Twenty-three years later he was ordained as auxiliary bishop of Buenos Aires before being made archbishop six years later. He was made cardinal on February 21, 2001, and in March 2013, he was elected Pope, taking the name Francis. He is the first Pope from the Americas, the first Jesuit, the 266th Pope and the 265th successor to St. Peter. Known as the ‘People’s Pope’ due to his unconventional ways and preachings that the masses can relate to, he associates with the poor and reminds everyone not to forget them. His ‘Who am I to judge?’ question to gay people and other controversial issues have prompted conversations about how Catholics view these issues. In December 2013, he was named Time magazine’s Person of the Year. During the same year, he spoke about the plight of immigrants, pushed for the improvement of the Vatican’s finances and transparency, suspended a German Bishop accused of misusing church money, and conducted a worldwide survey on social issues faced by families. Where can we meet Pope Francis? Pope Francis will be in the UAE for a three-day visit from February 3-5. He will officiate the Holy High Mass on February 5 at Zayed Sports City Stadium. Catholic faithfuls may register in their parishes for a chance to get free tickets to the mass. The church will distribute 120,000 bar-coded tickets by next week.